The latest iPads from Apple just got unveiled in the Philippines and it's now available in the local Apple PH online store. 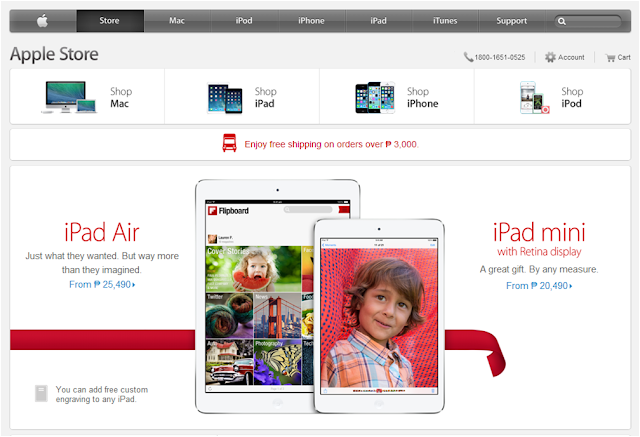 Prices of the iPad Air and iPad mini with Retina Display start at Php 25,490 and Php 20,490, respectively. These new iPads will also be available in your nearest Apple Store starting December 19, 2013. The new iPad Air is a revamped and thinned version of last year’s iPad 4; meanwhile, the iPad mini with Retina Display has the same old hardware but tweaked with better A7 chip and stunning display.